Hayate no Gotoku, The Overall View. Hayate no Gotoku may seem like a substandard harem anime at first, but after some careful watching I found this anime to be quite amazing. The characters are very well done and are extremelly fun to watch, and some are just plain awesome (HINAGIKU). The story revolves around a 16 year old boy who ends up with a giant debt and has to repay it by working as a butler to a 13 year old girl named Nagi. Along the way he meets many other women who ether crave to be with him, or to humilliate him or put him in the worst possible situation and laugh it up. The show's animation is colorful and easy on the eyes, but it's to creepy how well Hayate looks in a maid outfit O_O. There are some strange references (Obi-Wan Squirrel, The Cruel Angel's Thesis, etc), and the policy is if it can happen, it will, and it will make you go crazy with laughter. Over all this show should be one of the shows that you should check out and it's the best show's on this site. This is my favorite anime. Kinda sad it isn't continued anymore, but I still love it. It's about a young sixteen year old boy -- Hayate Ayasaki. He works as a butler for Nagi Sanzenin, a thirteen year old young lady who lives in quite the big mansion. His parents dropped a 150-million yen debt on him and left him in the cold as a Christmas present. Hayate works at Nagi's to pay it off. This anime is fairly good - For me the series kinda started off as slow and boring to me, but eventually I grew to love it. I'm happy I gave it a second chance. There's two seasons to the series. If you're new to the series, I recommend watching the FIRST season first, despite me starting with the second. Even if you watch the second first, you'll catch on. The Storyline is a rather interesting one, it seems that there are quite a few characters with bad pasts though. The background music is amazing - I find it very well composed. The opening songs are great, too. The characters have great designs, each one has its own characteristics and suits its persona. Animation is awesome for an anime. The manga's great. Season 1 was average. What about season 2? Personally, I prefer the storyline in the manga than the anime. It is because of the storyline in the manga has more content compared to what was aired in season 1(which had 52 eps) which was mostly random comedy(not that it's bad...but did not focus on the story). But the second season seemed to follow up on the story in the manga. The first season started off following the manga closely which pleased fans until it randomly went off into side stories which was just plain random and occasionally going back to the original story. In season 2, the story seems to stick with the manga faithfully and not jumping into random stuff. The animation is well done and the voice actors did a splendid job with their characters. Really similar to the originals in the manga. Probably not as similar when they go "chibi" and all but still good. Music was better in season 1 than 2 but it's still reasonably okay compared to others I've seen. This is probably due to my tastes in music as I do not particularly fancy the happy go lucky feel of some of the songs. Character development is pretty good but lacks background and pasts which relates to the present (e.g. the necklace and the location of the school has a relation to the later story..please read the manga if you wanna know) Character backgrounds wasn't a highlight in season 1 where their stories were all unknown. Further into the story, the characters' pasts connects with the new characters (like Athena and the Sister) and makes the story more interesting by breaking the monotonous comedic randomness. This is yet to be known as the interesting bits are way ahead of what is being aired right now. Overall, the anime good for anyone who's looking for a happy-go-lucky romantic comedy anime. Cant get enough of Hayate!!! 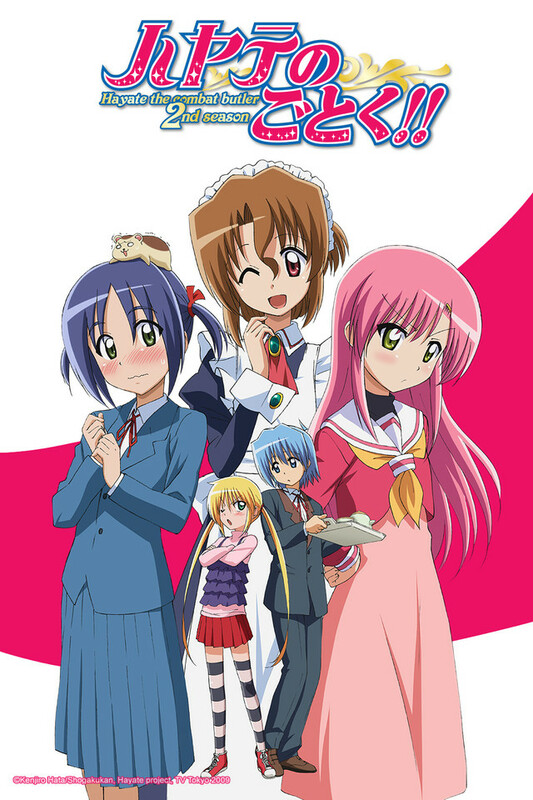 Hayate no gotoku is a hilarious anime that tells a story of a young boy named Hayate who becomes a Nagi's butler after taking on a 150 million dollar debt. But it doesnt stop there Hayate, Nagi and Maria the lovely maid create crazy memories as they fall in love, fight and just be themselves. This anime is packed with drama becuse it seems that every girl cant get enough of Hayate. Season 1& 2 will really leave you wanting more. So i hope there is a season 3!! But for now ill just stick to following their stories in the books each week. Ok.. So yeah, this is my first review, here I go.. I think that the Hayate no Gotoku's second season is better, and everything in it has been improved. The animation is more colorful and cute, even more cuter than the first seasons animation. The characters look also more cuter than in the 1st season. I suggest you to watch Hayate no Gotoku, right now! Hayate No Gotoku!!! Watch it with ME!!! Hayate No Gotoku!! is awesome! You get to see the extravagant lifestyle of Nagi and we imagine that she can probably have anything she ever wants but when it comes to love, it can't be bought. She tries to win the heart of Hayate but can she when he's such a lady's man? Lemme know what you think of this series! This was downright hilarious. Through and through it was written to not be taken seriously. It even goes as far as to laugh at itself multiple times, and the fourth wall gets broken so often it may as well not even exist. Even though the main character has a ridiculously depressing and sad backstory the way it's worded and depicted makes you actually laugh. I'm happy I broke down and watched this anime even though it looked like it was something I wouldn't enjoy. For something with the word 'combat' in it this has little fighting, and what violence that is there is more implied than actually shown (even when someone is getting hit with a paper fan it will cut to a different screen). I'm planning on watching it again with less attention to the story and more attention to the pictures and trying to find hidden meanings in the dialogue because of how many references this makes to other anime. It particularly likes referencing Code Geass, Death Note, and Lucky Star. This anime is wonderful! I love it! Highly recommended by me haha! If you love anime with love triangles in it, then this one is perfect for you! Usually I ditch an anime halfway through if it's boring, but for Hayate No Gotoku I actually sat through the whole thing. Definitely gonna watch Hayate No Gotoku: Can't Take My Eyes Off You! Anyway, you HAVE to watch Hayate No Gotoku! A butler's misfortune is our laugh. This show is one of those great shows where you just sit back unwind and watch as the story unfolds. A lot of these episodes are in short bursts (often side stories); they’re great to watch in sequence or simply to come back to when you need a good laugh. This show follows our super unlucky butler Hayate, who finds that his parents have left him with a mound of debt to some rather shady characters. Long story short, Nagi – a rich, young child prodigy - pays off his debt, and he finds himself working for her as her butler. So what makes this show so great? Well it’s simply funny, really funny. Hayate always finds himself in some awful/super embarrassing situation. And, well his misfortune is our comedy, haha. The comedy varies from slap stick to spoof humor. The spoof humor tends to have anime references in it and/or makes fun of anime in general. No matter what style the humor is, I always find myself laughing, and I’m sure you will laugh too. So if you’re looking for an anime to help you unwind then look no further: this is the anime for you! As you just thought, no limits were found in comedy/romance/action animes. This Anime knock out, all future animation. Animes of this stanard are hardly found every 10th year. last time I saw some thing as good were when Chobits were released in 2002. since i can't compare this to a long anime like: Naruto, Pokémon and more, I'll say it this way. i'd personally rather watch 77 episodes of this than 300 episodes of Naruto or 16 seasons of pokémon. Please be so kind as to respect my opiuon on this matter.